M.Sc. & Ph.D. in Botany (BHU); specialization in integrative ecology and sustainability science; current research interest includes carbon flux from tropical ecosystems, tree ecophysiology, ecology of plant invasion, restoration and conservation of natural ecosystems. M.Sc. & Ph.D. in Biochemistry (BHU); specialization in environmental biochemistry and stress physiology, metal toxicity studies, biosensors, bioinformatics; current research interest includes enzyme based biosensors, phytoremediation studies, environmental education and ecological modelling for food security and sustainable development. M.Sc. Botany (BHU), Ph.D. in Environmental Science (JNU); specialization in ecology, environment and sustainable development; current research interest includes ecosystem analysis, restoration- conservation ecology, natural resource management, biodiversity conservation, sustainable development, linking ecological components with socio-economic components, traditional ecological knowledge, ethno-botany, climate change, sustainable agriculture, land use land cover analysis. M.Sc. 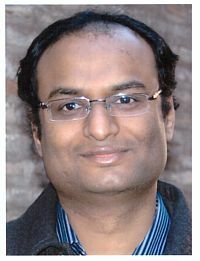 Tech & PhD in Geophysics (BHU); specialization in hydrometeorology & agrometeorology, climate risk management, simulation modelling, water resources, climate change; current research interest includes climate, hydrology, groundwater and crop modelling; system simulation, climate change impact/adaptation in water resource, agriculture and health, food security, disaster management, surface and ground water management. M.Sc. in Biotechnology (Thapar University, Patiala), Ph.D. in Botany (BHU); specialization inEnvironmental Microbiology, Soil-plant-microbe interaction, Sustainable agriculture, INM, organic farming (PGPR and PGPF), development of novel biofertilizers and biocontrol agents for multiple crop production,soil health management, impact of climate change on agriculture production, microbial degradation of pesticide and cellulosic material. M.Sc. in Environmental Science (Lucknow University), M. Phil. in Energy & Environment (DAVV, Indore), Ph.D. in Botany (BHU), specializes in ecotoxicology and waste management; current research interest includes management of waste via composting and vermicomposting, waste to energy conversion, food chain contamination, sustainable agriculture. M.Sc. in Environment Management (MG University, Kerala), Ph.D. in Environmental Science (CSIR-NBRI, Lucknow); specialization in environmental biotechnology; research interest include exploiting plant-microbe signalling and nanobiotechnology for multipurpose bioremediation, Impact of warming climate on microbial adaptation and functional diversity changes in soil, microbial control of soil carbon flux, adaptive soil management. M.Sc. & Ph.D. in Environmental Science (G.B.P.U.A.&T., Pantnagar);specialization in air pollution modelling; research interests includeair pollution dispersion modelling; modelling meteorology-air pollutant interactions; particulate source apportionment; characterization of tropospheric aerosols; aerosol and atmospheric chemistry; regional air quality-climate change interactions. M.Sc. in Biotechnology (MS University of Baroda, Vadodara) & Ph.D. in Botany (BHU). Research interests include plant responses to biotic and abiotic stress factors. Tools of plant physiology, biochemistry and molecular biology are utilized to decipher out how plants sense and transmit stress signals at the cellular level. M.Sc.&Ph.Din Chemistry (Physical Research Laboratory, Ahmedabad).Research interests includes Atmospheric and Aerosol Chemistry,Secondary Organic Aerosol, Carbonaceous Aerosols with emphasis on Black Carbon, Optical and Microphysical properties of Aerosols, Aerosol-Cloud Interaction and Climate, Indoor-Outdoor Air-Pollution & Control Measures, Trace Gases and Ozone Measurements, Stratosphere-Troposphere Exchange, Volatile Organic Compounds, Poly-Aromatic Hydrocarbons and Platinum Group Elements, Carbon Dioxide Capture and Sequestration. MSc & PhD in Botany (University of Lucknow). Research interest is to understand metal(loid)-plant interactions with the perspective of sustaining agricultural productivity and for using plants for the remediation in affected sites. Major focus is to develop methodologies or agronomic practices for growing rice having negligible arsenic content in grains. BSc (Ag) BHU, M.Sc. Environmental Science (JNU); PhD in Remote Sensing Technology from Department of Civil Engineering, University of Bristol, United Kingdom. He has worked in the Hydrological Sciences Laboratory, NASA Goddard Space Flight Centre, Maryland, USA. He has Specialization in Microwave soil moisture retrieval, Radar precipitation retrieval, Mesoscale and Hydrological Modelling, Optical/IR/Hyperspectral remote sensing, Evapo-transpiration, Sensitivity and Uncertainty analysis, Land use modelling, Natural Disasters.